James Bond 25 reportedly wants Rami Malek to play the villain in the upcoming sequel. Malek is best-known for the TV series Mr. Robot and now as Freddie Mercury in the Queen biopic, Bohemian Rhapsody. Daniel Craig is back as 007 for the new Bond movie, but original director Danny Boyle left the project, which then brought Cary Fukunaga on board to helm the 25th Bond installment. Seeing Malek on screen with Craig could be an excellent pairing for the iconic franchise. 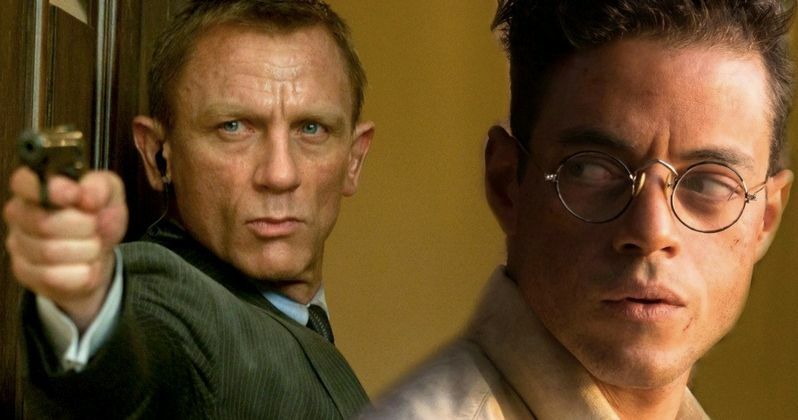 Rami Malek's name is reportedly at the top of Cary Fukunaga's list to play the villain in Bond 25. However, Malek's schedule may throw a monkey wrench into the whole idea. The actor is preparing to shoot the final season of Mr. Robot, and it looks like his schedule will be conflicting with the James Bond 25 production. The project has already suffered a few setbacks, so it remains unclear if Fukunaga and the rest of the crew will be able to work around Malek's schedule. Madeleine Swann has recently been confirmed to reprise her character from Spectre in James Bond 25, but a new actor may have to be picked to play the villain. Cary Fukunaga recently revealed that the script for the sequel hasn't even been completed, so there is still time to see if they can work around Rami Malek's schedule or just choose a different actor. Malek may seem like an odd choice for a villain at this time, but his star is on the rise and his presence would be a breath of fresh air for the franchise. Rami Malek definitely has the acting range to pull off a Bond villain. The actor has shown off his various talents in Mr. Robot and Bohemian Rhapsody, showcasing a dark and light side. Playing Freddie Mercury was no easy task, but Malek almost makes it look effortless. While the biopic has been criticized for a number of different reasons, Malek's portrayal of Mercury has been widely praised, showcasing a sensitive, but realistic version of the iconic front man. It would be really cool to see the actor pivot to a villainous character for his next role, especially considering that it's a Bond movie. At this time, it is unclear if Rami Malek will end up in Bond 25. With that being said, it looks like there are some hurdles that may make it too difficult for him to participate, which is good news and bad news. Bad, because that would be an excellent role for Malek, and good because he'll be able to put all of his efforts into Mr. Robot Season 4, which will be its last. Regardless, Rami Malek isn't going anywhere, so he could end up in a future Bond installment somewhere down the line. The Bond 25 Rami Malek villain news was first reported by Variety.